Showing how companies rise and fall over time doesn't make for a compelling story. As such, much more ink is spilled discussing why Companies X, Y and Z have the ability to outperform forever. But no company always beats the market. In fact, the norm is the exact opposite, as most companies selected for their outperformance (and then examined in books such as Built to Last) underperform in the years following such selection! If such companies really do have policies and processes that make them successful, why should they regress as soon as the studies are complete? 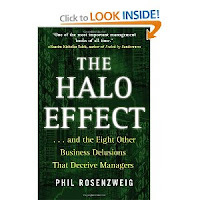 Rosenzweig argues that the authors of such studies are fooled by the delusion of lasting success: "We can tell ourselves that our handful of companies, selected by a rigorous and objective process, are a breed apart. But it's a delusion." The ROI's of successful companies always decline, and the ROI's of unsuccessful companies often increase. This is the result of creative destruction, as innovation and incentives drive competition to take a bite into successful markets. Arguing that a company has lasting success simply because another has yet to innovate a way into its moat is often a better explanation than some of the conclusions drawn that suffer from one of the other delusions.